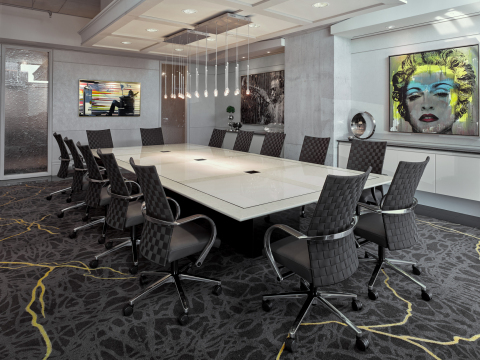 TORONTO--(BUSINESS WIRE)--A world-renowned mark of excellence, International Property Awards named McGregor Design Group’s contemporary space for a Toronto gold mining company ‘Best Office Interior’ in the country. 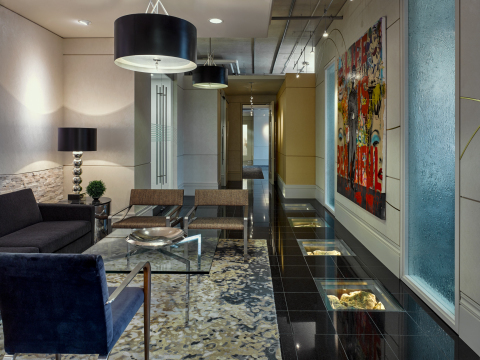 Situated in a LEED Silver building, the once open raw concrete space was converted into a polished executive office—reflecting the mining business while showcasing the owner’s art collection. Against an ‘art-friendly’ white canvas, McGregor’s team incorporated: vertical reveals and curvilinear metal inlays to reference dunes; precious rocks in recessed illuminated boxes to suggest being underground; and custom carpets hand-embroidered with glittering silk threads to resemble gold dust. Moreover, the team decidedly sourced much of the furniture locally—including the Canadian granite floors. Founded in 1988 by Lynn McGregor, MDG is an award-winning architectural interior firm that creates commercial spaces to enrich people’s lives and help organizations succeed. Our mission is to deliver sustainable and innovative ideas that meet human and environmental needs, while not only focusing on achieving client expectations—but exceeding them.